Writing about food isn’t as easy as it looks. 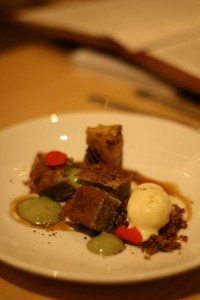 It’s especially challenging when one’s called on to write about the kind of food on offer at Terre à Terre, which is a complex panoply of ingredients, flavours and textures unlike anything you’ve probably eaten before. It’s the sort of food one hopes to eat in a restaurant with such a legendary status it’s built a cult following. Food that’s considered so pioneering and creative it regularly wins over even the most committed of meat eaters. 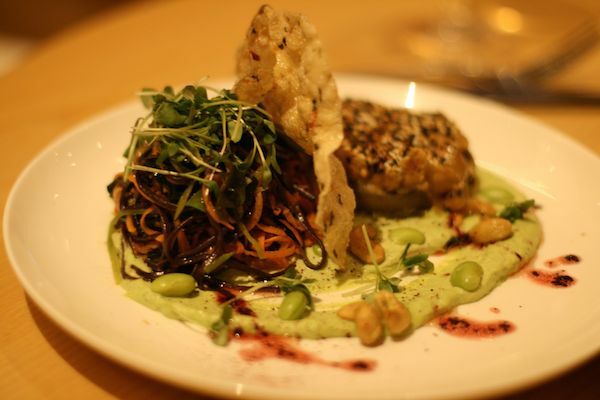 Food that’s garnered Terre à Terre a regular appearance in the Observer Food Monthly awards, including being voted runner up this year as best restaurant and also best ethical restaurant for the whole of the UK. That’s an astonishing achievement, when you think about all the vegetarians and vegans who visit the UK from around the world, and all the numerous restaurants ready, willing and able to cater to their tastes and respective culinary cultural influences. That’s quite some competition for Terre à Terre to be up against. Thankfully, the chefs here seem to like a bit of competition and are pretty good at it. They’re also good at incorporating a wide range of different influences and ingredients into their cooking – as one look at the menu will reveal. Not that the menu can be looked at just briefly, to be honest. On the website it says this is a place “where vegetarianism is more about indulgence than abstinence” so it’s fair to say the owners and chefs like to make a celebratory meal of things. Be warned; that incudes the menu, which must be the longest and most descriptive I’ve ever read. The menu isn’t as serious and arduous as it sounds though. A lot of humour and creativity has been deployed in writing the dish names and descriptions. The intention is clearly that people enjoy the whole experience from the moment they walk through the door. 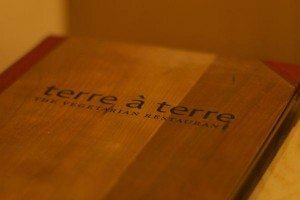 So, as we took our seats in the brightly-coloured dining room, we asked our waitress to bring whatever the kitchen wanted us to try, to best give an insight into what Terre à Terre food is all about. To kick-start that process in a suitably celebratory, festive fashion, we had a glass each of the delicious sparkling organic Davenport Blanc de Blancs wine from the Limney Estate in East Sussex, which got things off to a tantalizing start. 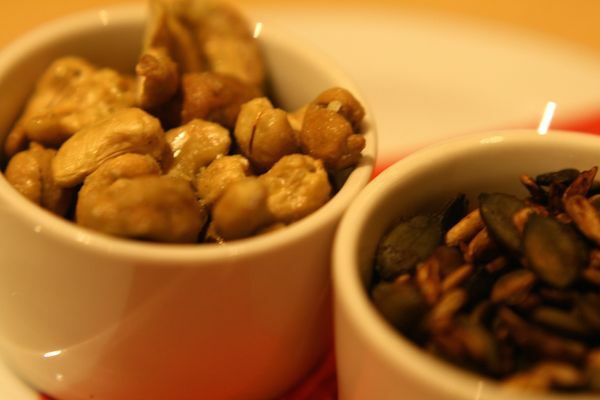 The wine was crisp but smooth and a refreshing counterpart to our accompanying sweet and spicy wasabi cashews and the savoury and salty tamari roasted pumpkin and sunflower seeds. 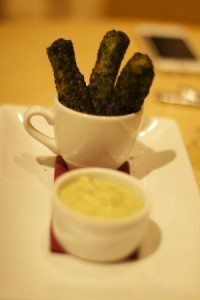 As a prelude to our actual starters, we were then presented with the Kraken Kodachi Churros to whet our appetites, which are like posh bread sticks with less bread but more goodness and oomph. The churros looked striking covered in black and white sesame seeds and were warm, crispy and also chewy; made from a combination of wakame and nori kombu seaweeds, spinach, black sesame flakes and shichimi togarashi spice; a Japanese blend of seven different spices. They worked well with the lightly sweet and creamy accompanying miso mirin mayonnaise. Next up we were presented with two starters, which we shared: the Cereal Thriller and Eats Beets and Cheese. The Cereal Thriller was really novel and looked like breakfast, an amusing idea for our first proper dish. 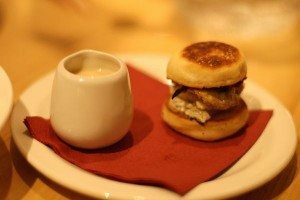 We were given two small plates and a little pouring jug: on one plate was a dainty toasted buttermilk British muffin filled with truffle egg omelette and truffle butter, which was delicious and rather moreish (although we only had one between us, so half each was a fairly modest mouthful). Accompanying the muffin was the cereal and jug of ‘milk’ – puffed grains mixed with fairly sizeable pieces of poached sour apple, walnut hash, soused blackberries and crimson beets, golden raisin ‘escabeche’ and crunchy circles of kohlrabi, with garlic, paprika, gran padano cheese and toasted pine nuts. On top of that we poured a warm ‘cocco’ bean and mace milk to which had been added chestnut and celeriac purées. Like I said, the food at Terre à Terre is such a complex mix of ingredients it takes a moment for one’s brain and taste buds to catch up. There’s then an explosion of different flavours, which is wonderful. 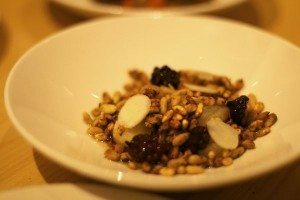 I liked the texture of this dish – the grains were puffed so they had a crunch but weren’t too hard, and their usual blandness made a good backdrop for the more savoury and slightly salty elements of the dish, such as the cheese and pine nuts. The fruit was more tart and sour than sweet, which I enjoyed, and the softly creamy ‘milk’ brought all the flavours together in a gentle way. It was unusual and enjoyable. I liked it. 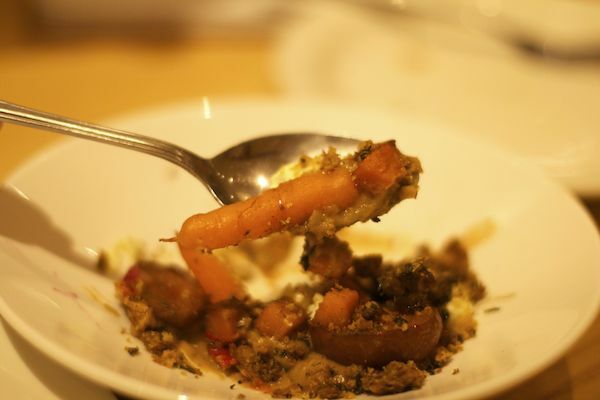 Eats Beets and Cheese was more straightforward in flavour but equally tasty – like a deconstructed root vegetable crumble made from beets, carrots and potatoes mixed with a pumpernickel sage and caraway bread sauce and a shallot purée, then topped with a buckwheat potato crumble and crunchy rosemary thyme meal. The rustic purples, browns and dark orange colours were brightened by small spoonfuls of homemade sheeps milk ricotta, which added a richness and lightness to the dish as a whole. Very tasty – we were impressed! After a brief respite, we pressed ahead with our mains; the very Christmassy Baubles and Boudin and the all-year-round superhero stalwart Aubergine Dengaku, which I’ve enjoyed on a previous visit. Again, we shared both dishes. Baubles and Boudin was a bit like a posh vegetarian sausages and mash, with the salsify acting as the sausages. The salsify root had been braised in a veggie verison of dashi then rolled in almond allspice and cinnamon pepper crumbs and fried, so it had a crunchy exterior and a surprisingly firm rooty inside. Sitting on top of the dish was a proud baked parsnip, with parsnip purée beneath the salsify as a creamy sauce. Alongside that was a glorious vivid heap of sweet clove red cabbage and a generous mound of creamy mace and zest pomme purée, plus a smokey crimson beet purée and nutmeg butter spinach. This was my favourite dish of the evening, despite stiff competition. It was deliciously sweet, savoury, wintry, warming and suitably spicy and was luxurious and festive. I’d definitely order that again. The Aubergine Dengaku was different but held its own. It’s an intriguing, unusual dish that works well in all seasons and has a fantastic array of Asian flavours. The aubergine is baked in sake and sizzled with tahini, sesame and white miso. It’s served molded into a round disc-shape sitting on top of a big green swirl of pesto made from puréed edamame beans, wasabi and yuzu. Next to that is a pile of seaweed and vegetable thread noodle salad with a crispy seaweed rice cracker sticking on top. There’s a lot going on here, but the overall impression is fresh and somewhat zingy. The aubergine is sweet and soft and the vegetable thread salad has a subtle combination of ginger and sesame. Delicious. It was just as good as the last time. A glass of creamy Viognier brought out the Asian flavours perfectly. Desserts at Terre à Terre are always a treat and unmissable in my humble opinion. 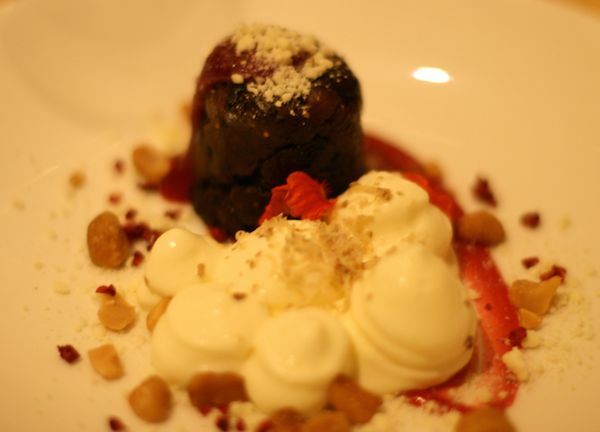 The Truly Plum-sious is definitely the seasonal festive choice; hot figgy Christmas pudding with white chocolate custard, maple macadamias and cranberry quince jam, finished with shaved chestnut and white chocolate salted crumble. 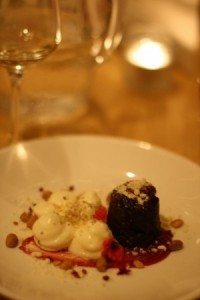 It was truly divine and a pud I’d happily eat all through the Christmas season, given a chance. It sounds incredibly sweet but the balance was just right; light, creamy, fruity and chocolatey. The hot banana almond spice cake was more tropical – the first mouthful transported me to a sunny island in the Caribbean with swaying palm trees! Cinnamon and nutmeg enhanced the banana, as well as sweet white miso, star anise, pineapple in a clove laced syrup, rum parfait ice cream, coffee bean hazelnut praline, espresso syrup and banana pistachio cream. Once again, there was so much going on in every mouthful but somehow it all worked together in a smooth and sweet symphony. Another glorious dish! The literal translation of Terre à Terre is earth to earth, or down to earth as it’s more commonly known, but to me this is a bit of a misnomer. Yes, it’s a restaurant that cares a lot about food ethics, provenance and sustainability, but a meal there flies you around the world in a rich journey of learning and adventure. I’m not the first to say it and I won’t be the last. 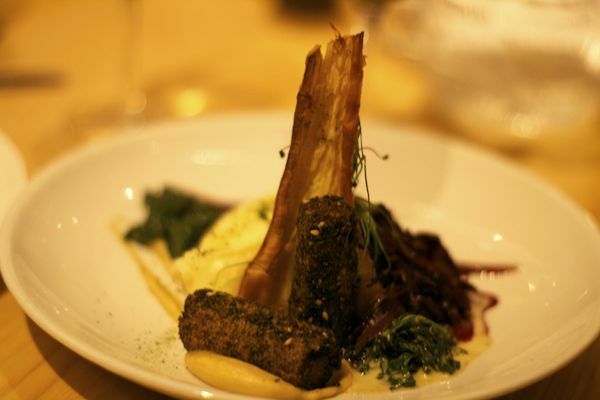 We’re lucky to have this food in Brighton so if you’ve never been, you must. 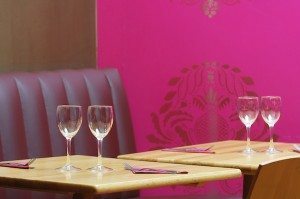 Make a Booking on 01273 729051 – it would be great if you mention Restaurants Brighton when you do!